This remarkable three volume collection encompasses numerous and varied stories of acts and deeds of crime and violence. Paul White has once again woven his masterly spell of intrigue into each stories plot. Secrecy, scheming, plotting and conspiracy live hand-in-hand with outrageous and shocking violence, viciousness and brutality. All three volumes of Tales of Crime & Violence are packed with carnage and bloodshed and mayhem, while an ominous sense of sinister, physiological apprehension lingers in the dark shadows. Tales of Crime & Violence contains graphic acts of violence, profanities and sexual reference. It is not recommended for reading for those under adult age. Tales of Crime & Violence is available in a paperback collection of three volumes, or on Kindle as a complete ‘box-set’. ……….The Sheriff stopped, as did the two deputies in the following cruisers. Together we walked to the car. I handed one of the deputies the keys. You could feel the heat reflecting from the steel of the bodywork. It was one hell of a hot day. When the deputy opened the driver’s door a blast of superheated air escaped. It was so extreme it forced us to take a step backwards and twist our heads away from its intensity. But it was the smell which was most overpowering. I saw, but did not comprehend the glance between the law men. However, I knew that my day was going to get worse when they handcuffed me. My day certainly became a living nightmare when they opened the trunk. Bobby lay inside. His throat had been sliced from ear to ear and his eyes gouged out. The heat had caused his body to swell and the blood to cook. I only recognised him by his jeans and boots. After that it was all a bit of a blur. I was bundled into the sheriff’s car and we raced the few miles to the motel. It looked as deserted as when I left a few hours ago. From room fourteen all the way to room twenty the doors were open. They were the doors I kicked open during my frantic search for the others. I explained this to the Officers. The thing that interested the Sherriff was the sign hanging from the doorknob of room thirteen. I had not noticed that sign in my earlier panicky state. It said ‘Do not disturb’. What was interesting the lawmen most was the smudged bloody handprint on that sign. The Deputies drew their guns and crashed the door. It flew open. The intense odour of putrid dead flesh flooded my nostrils. Inside the room, laid out across the bed were Kathy and Taylor. They were tethered to the bedstead with strands of rusting wire cable, spread-eagled and naked. Their stomachs had been slit open and their entrails extended across the floor. I am so proud to be hosting the re-launch of this incredible book. I read ‘The Distant Sound of Violence’ a few months ago, and the messages within it and the depth of the plot have stayed with me ever since. (I have now passed this book on to others, because I can’t seem to go a single day without recommending it to somebody!) This book also features Nathan Dawes – one of the greatest literary characters I have ever seen! An all-round incredible book and definitely an author to watch out for. 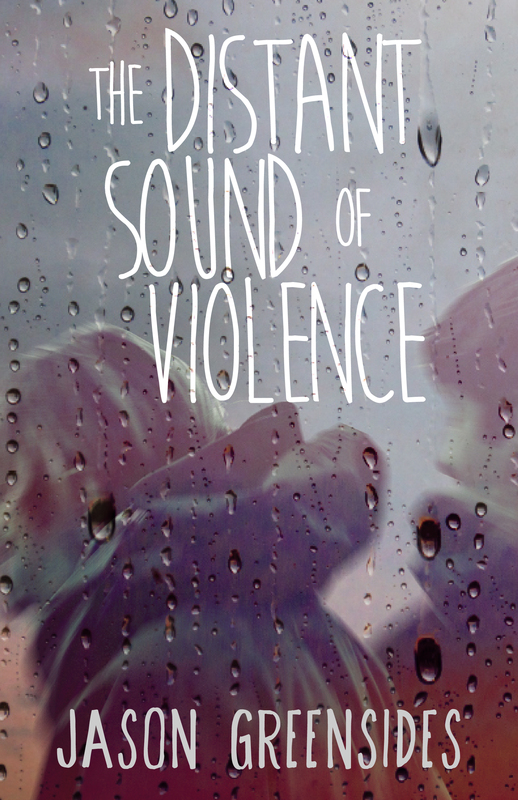 To celebrate the relaunch and Kindle $0.99 / £0.99 promotion of Jason Greensides’s acclaimed literary coming-of-age debut, The Distant Sound of Violence, you can read the first seven chapters on seven different blogs over seven days. I’m proud to host Jason for day three of the tour, featuring chapter three. Do we ever escape the decisions we make when we’re fifteen? Nathan Dawes, the loser from school, an outsider, street philosopher and member of The Grove Runners gang, needs Ryan’s help to get Stephanie to fall for him. When Ryan’s lawnmower is stolen, Nathan sees this as his chance to enlist Ryan in his plan. Although Ryan knows becoming friends with Nathan could lead to trouble, he reluctantly agrees to help. Stephanie wants nothing to do with either of them. Besides, she’s more interested in the one guy in the world she really shouldn’t be. As Nathan continues his pursuit of Stephanie, and Ryan gets mixed up with The Grove Runners, soon events overtake them all, haunting their lives for years to come. This intelligent and compelling debut is a heart-breaking tale of bad decisions and love gone wrong. It’s about choices that lead to violence, loss and tragedy. The reason Nathan had sat back and watched as some random kid stole my aunt’s lawnmower was because of Stephanie Redding. He’d seen me around school, knew I was never without a girlfriend, and figured if he could get the lawnmower back for me then I would have felt obligated to speak to Stephanie on his behalf, put in a good word for him, somehow work my magic to get her to fall in love with him. What Nathan didn’t realise was that I was starting to feel sorry for him and his need for a girlfriend, even if he had caused me problems with Karen, and at that point I would have helped him anyway. Perhaps if I’d told him this at the time, I might have been able to stop what happened next. That same afternoon, he skipped detention and scampered out the back entrance, took the bus home and changed into a navy blue Nike tracksuit. There, he waited for it to become dark, before setting off towards the Harrow Road. Ignoring the blaring horns of cars forced to slow down to let him pass, Nathan crossed the road at the point where he and Dwain had been arguing the previous evening, and disappeared into the gloom of the alleyway next to Lee’s Arcade. He unlatched the gate, crept across the garden and peered into the darkness of the shed. He pulled out a torch and shone the light through the window. After a few seconds, in amongst the gardening equipment and mountain bikes, he spotted the lawnmower sitting behind a Suzuki FA50 moped. He clicked the torch off, spun it around in his palm and used the handle to smash the window. Clearing away the shards of glass, he reached inside at full stretch, grasped the lawnmower’s handle and pulled it towards the window. He placed his elbows on the window frame for leverage and lifted the lawnmower up into a horizontal position. But the lawnmower was heavier than he’d anticipated, so, as he paused to gain a little more strength in his arms, the lawnmower fell into the moped, causing the bike to crash to the floor with a loud, nasty crack. He spun around to make sure no one had heard the noise, rivulets of icy sweat breaking across his brow. Finally, seeing no movement from the back of the house, he hauled the lawnmower through the window and lugged it out to the street. By the time Nathan had dragged the lawnmower off the bus at Kensington Church Street and onto Campden Hill Road, the clouds had begun to disperse. He sat down in his usual place opposite Stephanie’s house. He’d been going there every other night since the beginning of term, hoping to catch a glimpse of Stephanie through the living room window, or perhaps as she took out the rubbish. And now, if she’d come into the living room and peeked through the velvet curtains, she’d have seen a young man, half-hidden by rosebushes, staring up at the house with yearning and hope; this boy now cradling his head in the moonlight, hair ruffled by the midnight breeze, a lawnmower sitting by his side, so consumed by solitude he was willing to die for her. If she’d seen this then perhaps she’d have gone down to him in her pajamas and, at the very least, shooed him away in case her mum spotted him. As it was, she slept soundly in the back bedroom, oblivious to the madness of love imploding in the heart of this reclusive boy from school. Several days after my aunt had come hobbling into my bedroom, saying that she’d bore witness to the miracle of her lawnmower sitting outside the front door, I finally found the right opportunity to speak to Stephanie. I didn’t share any classes with her, while she usually spent her break with her friend Taylor Brown, so finding the right moment to approach her was a real pain. Then, one morning as I apologised to Peter about missing football practice (again), I spotted her. She was sauntering along with her gaze fixed on the floor, wearing her purple, blue, and white shell suit top. ‘Hey, Stephanie,’ I said, telling Peter I’d see him later. He dropped away into the crowds of children. Although I’d never spoken to her before, she didn’t even crack a polite smile. ‘Yes?’ she said, slowing down but not stopping. Traces of a smile played at her lips and her nose twitched, as if she were trying to ward off a sneeze. ‘OK…?’ she said, moving to one side, giving us a chance to talk without being knocked over by manic year-sevens. I searched her eyes for some clue how to proceed. ‘A friend of mine has seen you around and thinks you’re gorgeous,’ I said at last. ‘Oh,’ she said, pursing her lips, the light going out of her eyes – not the response I was after. Did she know I was talking about Nathan? She checked her watch – a big, cumbersome pink thing with a picture of Dumbo on the face – then glanced over my shoulder. ‘The freak?’ she said. It was a harsh remark and she seemed to know it. She shuffled on her feet, rubbed her arm with a fist as if she were cold. I smiled, trying to hide how gutted I was that Nathan’s dwindling chances with this girl were fast becoming non-existent. She blinked at me, swung her bag onto her shoulder and searched for an ebb in the river of children into which she could dive into. Clearly, trying to find a connection with Stephanie through a reference to a nineteenth century German philosopher hadn’t worked. ‘Ryan. Sorry, I’ve got to get to PE.’ And with that she loped off with Taylor. 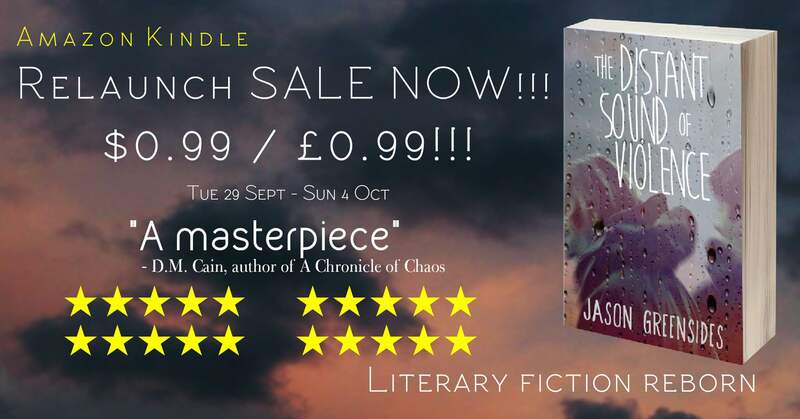 The Distant Sound of Violence is on sale $0.99 / £0.99 Kindle countdown deal from Tuesday 29th September to Sunday 4th October! Jason Greensides has a degree in Video Production and Film Studies and has made several short films, two of which have been broadcast on television – but writing fiction is his real passion. He’s interested in ‘outsider’ types, people operating on the edge of society. 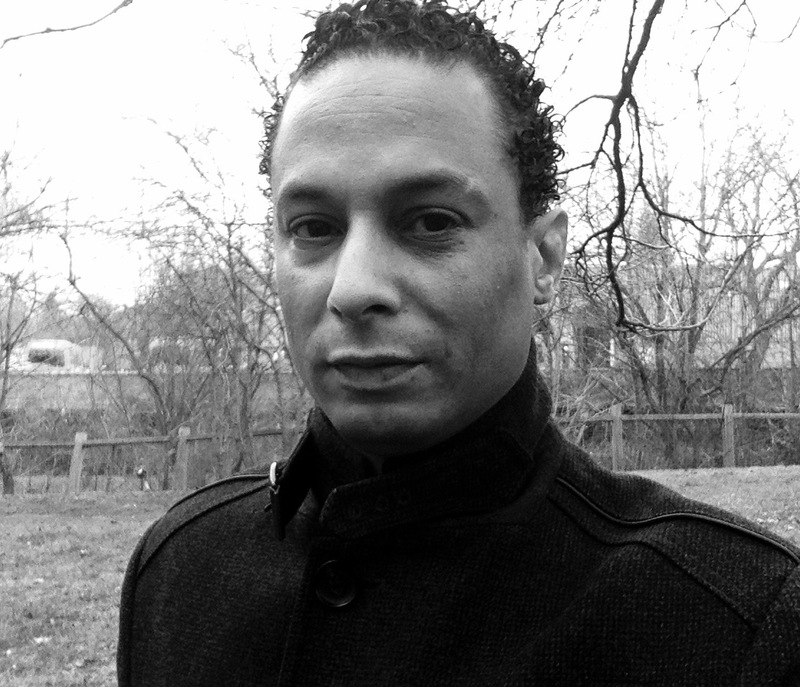 This inspired him to write his first novel, The Distant Sound of Violence. It’s about a group of kids, one in particular, Nathan Dawes, whose philosophical obsessions and criminal connections have made him an outcast at school. Jason is now working on his second novel, another coming-of-age mystery, but on coffee breaks he blogs and tweets about writing, and throws in the occasional book review.